There are no peoples who do not sing. The whole world is a planet of song. The desire to sing is therefore natural to humans, and the desire to sing in a choir is more natural still. Choral singing is demonstrably universal, to the extent that practically all cultures have adopted it yet no single culture can claim to be its originator. 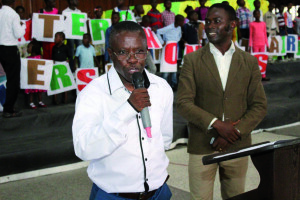 In the Democratic Republic of the Congo, as in most African countries, the choral movement began to take shape with the arrival of missionaries, and so has a privileged position within the missionary churches, where it has put down solid roots. The richness of the choral movement lies in its immense diversity. Its character can be religious, social, educative, scientific and cultural. It transcends boundaries of age, gender, social class, intellectual level, race and culture. Choirs remain the sort of musical groups which can spring into being spontaneously, in any place and at any time. Besides existing choral groups organised according to age (children’s choirs, youth choirs, and adult choirs) or gender (mixed choirs, women’s choirs and men’s choirs), other groups have come into being and continue to spread. Among these groups are inter- and extra-parish choirs, extra-liturgical choirs, school choirs, communal and inter-communal choirs, community choirs, inter-community choirs, confessional choirs, inter-confessional choirs, and even federal choirs. All these groups share a precious, immaterial and inexhaustible asset: the innumerable songs written by Congolese composers, as well as songs imported from abroad. The choral repertoire is one of the greatest riches of the choral movement and of humanity as a whole. It is always accessible to all and can be shared, as it is even today, without the hindrance of excessive egoism or constraints. Well transcribed, edited, published and protected, it traverses and transcends space and time. Many of the songs recorded in our Congolese church anthologies, translated into African languages, have come down to us from centuries past. It remains a source of astonishment that in societies like ours, no measures are taken to protect these precious treasures, true legacies of humanity and an immensely valuable possession for the Church and for society. 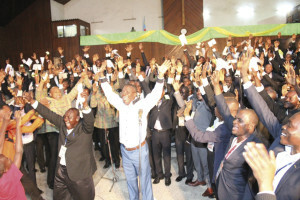 Georges Landu Mwan’Anlongo, Robert Zulu Mpinda Makiadi, Prof. Noé Diawaku dia Nseyila, Emile Disengomoka, Ngonde Nsayila, Maitre Looli, Ekofo, Joseph Kiwele, Prof Meno Makilutila, Jean-Pierre Tadi Tambwe, Luzeyidio Sisi – these are just a few of the eminent Congolese composers who made a name for themselves with discretion and modesty: they crossed the earth but left few traces upon it, for they were ignored and reduced to silence in their lifetimes by a lack of effective organisation and opportunities for development. And what of those who are still living, such as Dolumingu Lutunu, Justin Ntumba, Nzeyi Van Mubuma, Ntoya Kapela, Jacques Nkalambote, Ignace Mayemba, Makiese Kiavila, Maurice Mondengo, Joseph Nsilulu, Zena Malengo, Matondo ma Mbalu, Freddy Phaku Duma, Mayindu Solo, Daniel Makasi and Ambroise Kua Nzambi Tokos? Should they also expect to suffer the same fate? 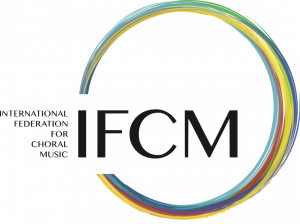 The Inter-Community Festival of Men’s Choirs should also be an opportunity to exchange opinions on subjects of crucial importance, of universal and worldwide relevance. This is genuinely necessary for the choral movement and for choral ministry. Choral associations and those involved in choral singing are in real need of a number of positive experiences that can generate a genuine and significant evolution within the choral movement as well as in our ministry. the growth, unity and testimony of the Church. A strong, fertile, creative, innovative, tenacious and forward-looking leadership is necessary, and a genuine collective awareness of the situation is also imperative. 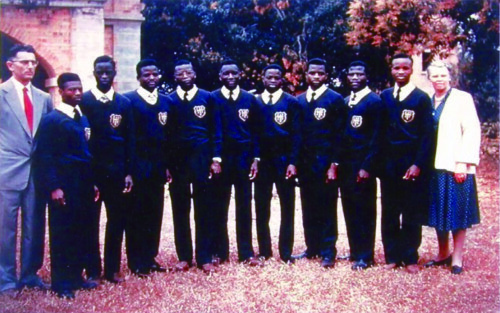 The event is initiated by the Centenary Men’s Choir, which was inspired by the Annual Week (the second week of November of each year) entrusted to the Protestant Centenary of the Cathedral Papas’ Commission for a special cultural celebration on the second Sunday of November, putting more emphasize laymen. 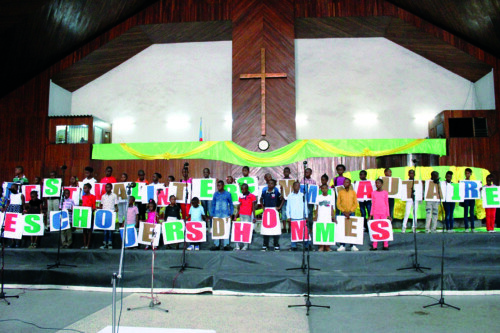 These special festivals, celebrated in the International Protestant Parish of Kinshasa – Centenary Protestant Cathedral, which is an inter-community parish and open to the wider public, seemed an obvious opportunity for bringing together men, a task that is made much easier by an event the size of a sacred festival that can gather more men as well as men’s choirs and graft them together without prejudice. The vocation of the Inter-Community Festival of Men’s Choirs is to highlight men’s choirs in all their diversity: the parish, inter-parish and extra-parish, liturgical and extra-liturgical, community and inter-community choirs, all of which are composed of male singers who are evolving within male choirs, mixed choirs (tenors and basses) and other types of musical ensembles. A biennial event, the festival will alternate national and international editions, which will give foreign choirs the opportunity to actively participate. The beautiful and wonderful site that brings together the great Protestant University of Congo (UPC) and the Centenary Protestant Cathedral will welcome this great and unique festival. It is located in the heart of the city of Kinshasa (capital of the Democratic Republic of the Congo), in one of the most tourist areas of the city centre thanks to its proximity to the People’s Palace (Headquarters of the Congolese Parliament), the Martyrs Stadium, second largest stadium in Africa, the large boulevards, the National Museum, the Cinquantenaire hospital (one of the largest and most modern in Africa) and many other locations. The Centenary Men’s Choir was created in order to provide one of the largest parishes of the Church of Christ in Congo, the International Protestant Parish of Kinshasa – Centenary Protestant Cathedral, with a musical formation composed exclusively of men. 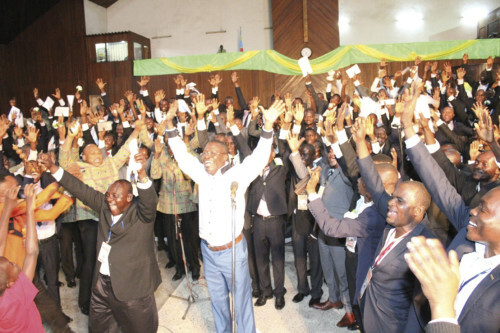 Having benefited from the patronage of the College of Bishops, the group was quickly organized and structured to be officially launched on 9 November 2014 by Monsignor Pierre Marini Bodho, National Chairman of the ECC, during the annual Father’s Day celebration. 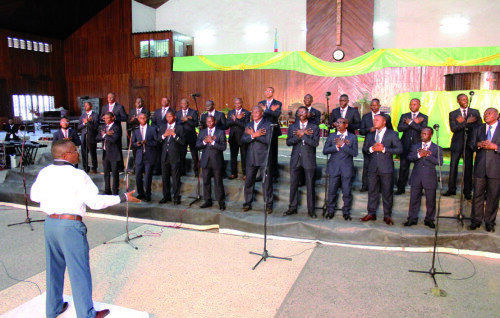 The Centenary Men’s Choir has set itself the noble challenge of becoming a centre of excellence and above all a forum for the men’s choirs of the city of Kinshasa and of the country, as well as those beyond the national borders. Our approach is to create a positive image of men’s choirs, by initiating large-scale projects, imbued with religious approaches and showcasing African ingenuity in the field of choral singing. It is directed by Ambroise Kua-Nzambi Toko and Lajoie Makiesse. The organization of this great unprecedented gathering of Men and Men’s Choirs is worth its weight in gold. This is a first in the history of the Church. 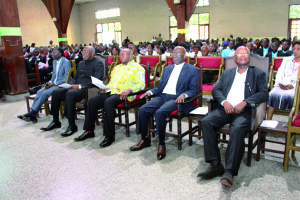 Initiated by the young choir, it was sponsored by the Pipkin Papas Commission/Centenary Protestant Cathedral and was held from 1 to 8 November. It was sponsored by the DIREKT.TV chain, the Lingala Facile TV news, the African Academy of Choral Music, the La Référence Plus newspaper, the Radio-ECC and the Pipkin/CPC Choral and Musical Commission. The presentation of the selected choirs in the 20 partner parishes and in the Centenary Protestant Cathedral. The exchanges between men’s choirs. The training session for conductors and aspiring choir conductors, certified by the trainers from the African Academy of Choral Music (Ambroise Kua-Nzambi Toko and Dolumingu Lutunu). The establishment of a common song repertoire. Exposure during the festival week. Programmes and broadcasting on radio and television.